March is National Nutrition Month, a great reminder for individuals of all ages of the benefits of choosing foods that promote good health. The chefs at Welch Healthcare & Retirement Group's Allerton House Assisted Living Communities help take the guesswork out of the equation by providing the right foods that are aimed at enhancing both physical well-being and mental abilities. Good nutrition and physical activity are basic elements of feeling happy, healthy and fit. Welch Group's Allerton House Assisted Living chefs take the guesswork out of creating delicious and heart healthy meals. March is National Nutrition Month, a great reminder for individuals of all ages of the benefits of choosing foods that promote good health. Good nutrition and physical activity are the basic elements of feeling happy, healthy and fit. And the foods that are good for the body can tickle your taste buds, too, especially at Welch Healthcare & Retirement Group’s Allerton House Assisted Living Communities, located along the South Shore of Massachusetts. The Allerton House chefs take the guesswork out of the equation for the assisted living residents. They are well-versed in the most recent Dietary Guidelines for Americans. 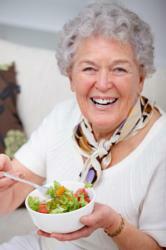 They know that certain vitamin and nutrient needs change with age. They recognize that the right foods enhance both physical well-being and mental abilities. Best of all, they prepare and present a colorful and appetizing array of menu options that we think is comparable to the fare at many excellent restaurants. Allerton House chefs balance menu choices that will lower cholesterol and reduce the risk of heart disease and cancer with classic New England fare that residents also relish. Superfoods such as blueberries, broccoli, oranges, spinach, tomatoes and salmon share the menu with prime rib, baked stuffed shrimp and zucchini parmesan. The chefs at Welch Healthcare & Retirement Group’s Assisted Living Communities are no strangers to the culinary cutting edge. Several Allerton House chefs recently met up with Marc Orfaly, executive chef of Pigalle in Boston. Orfaly, who is among Food & Wine magazine’s Best New Chefs shared some of his secrets, as he prepared clam chowder, grilled tuna steak, and lobster boil with homemade sausage. The cooking demonstration and wine pairing was one of several programs recently organized by Orfaly, who earned his culinary arts degree from Johnston & Wales in Providence. His resume includes experience cooking at Olives, owned by Chef Todd English; No. 9 Park in Boston, with Chef Barbara Lynch and L.A’s Patina, owned by Chef Joachim Splichal. Orfaly and his wife, wife, Kerri Foley, co-own Pigalle.